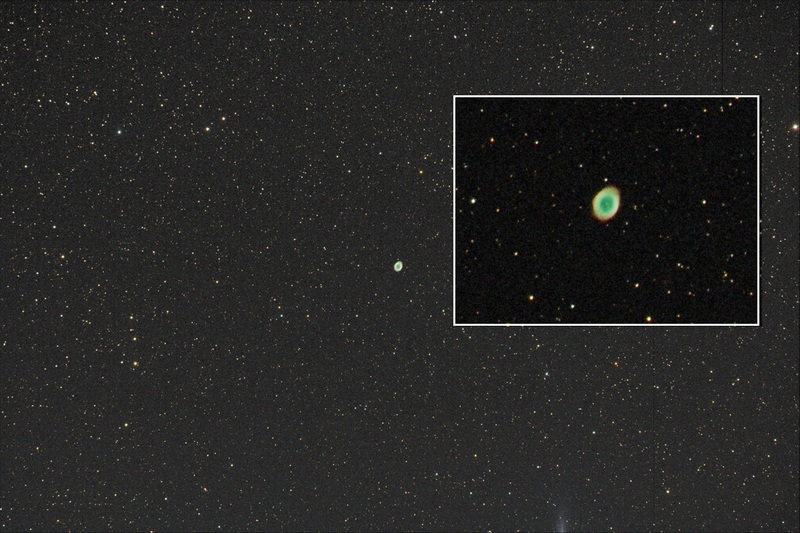 This latest image is of M57 the Ring Nebula in the constellation Lyra. This planetary nebula is the gaseous remains of a star that was once a red giant and approx 2,300 light years distant and can be found near Vega, part of the Summer Triangle and between another bright star. Visually this is supposed to be an easy target but I always struggle with this when star hopping with my telescope, maybe I’ve just not trained my eye enough (averted vision) or I’m just getting old. It doesn’t show any colour visually, as most astronomical objects don’t. With a magnitude of 8.8 (the lower the number the brighter the object) this nebula is best seen with at least an 8″ telescope, like I did for this image. The image is comprised of 12 x 20 second exposures completed over several nights, stacked and aligned together.